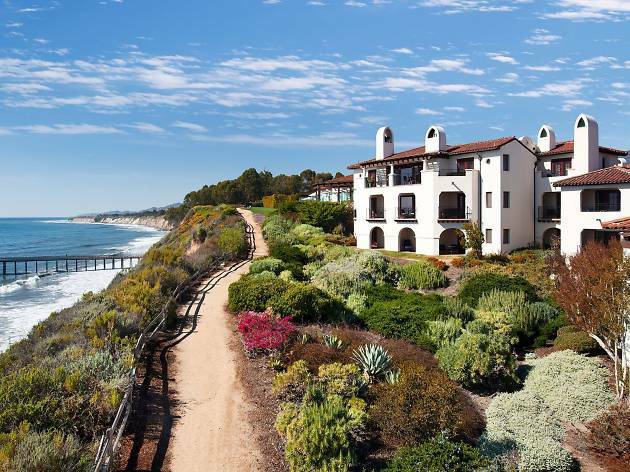 Choosing between Santa Barbara hotels for a top-notch getaway can be tricky—there are loads of options, and their offerings differ greatly. Would you rather be beachside or tucked into the hills? Is a pool a must? How about entertainment for the kids? Are you keen to be near the city’s great attractions and tastiest restaurants? Or maybe you’re on a budget, but can’t stand the average motel vibe. 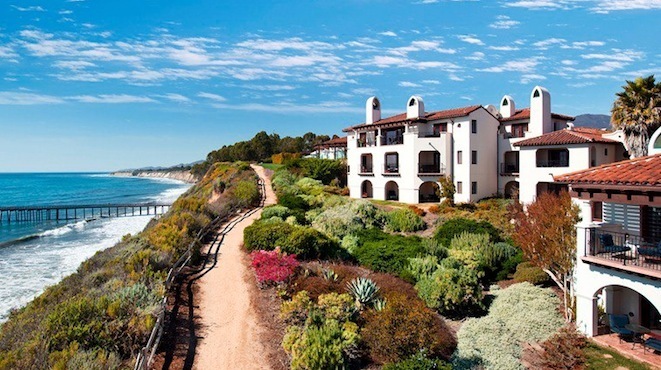 Whatever your requirements, we’ve scrolled through Santa Barbara's many hotels and rounded them down to the best, so you're bound to find something here for your perfect stay. 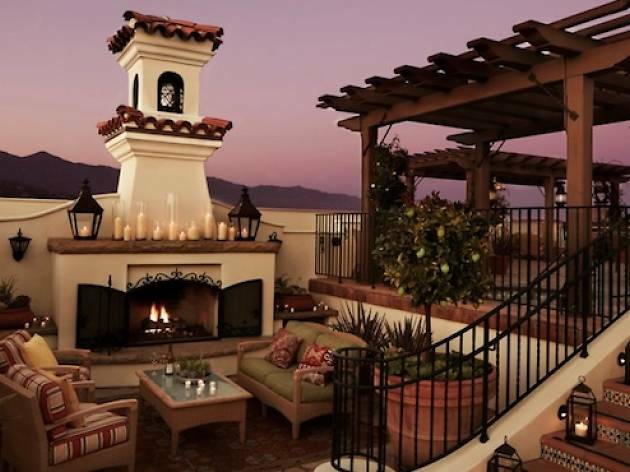 Nestled in the heart of downtown Santa Barbara, this boutique hotel charms visitors with thoughtful amenities and gorgeous city views. 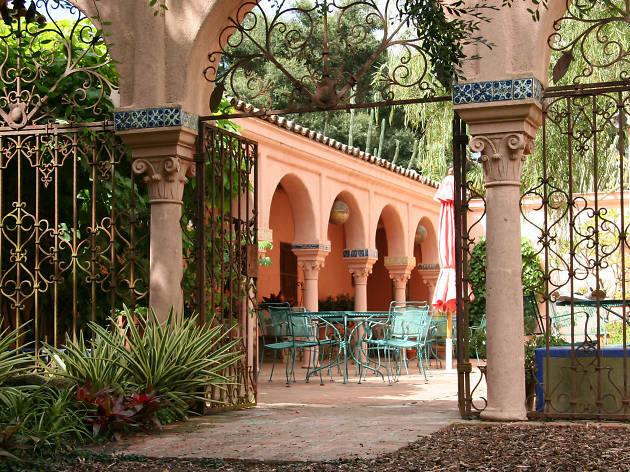 Each intimate Spanish-style room comes with an incredibly cozy four-poster bed, hardwood floors, hand-painted tiles and—why not—a complimentary yoga mat. Hotel restaurant Finch & Fork serves delicious shareable tapas such as fish tacos and lamb burgers that can also be enjoyed in your room or on the terrace. 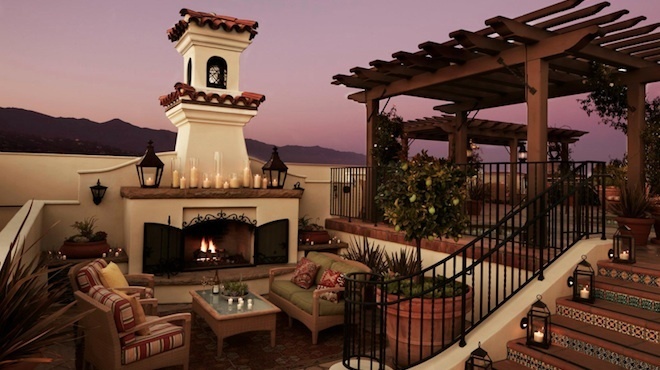 The rooftop is the true gem of the hotel—lounge by the pool and admire the 360-degree views from mountains to sea, or cozy up by the outdoor fireplace for stargazing. The Canary is also pet-friendly, without additional fees or restrictions. With this kind of hospitality, you might find it hard to leave. 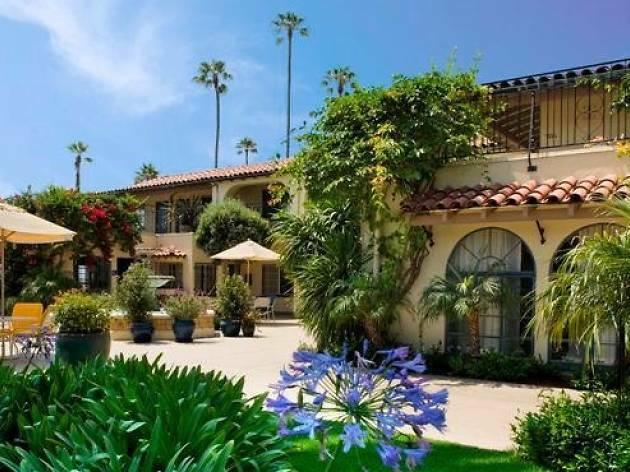 Quick stats: Pool, spa, pet-friendly, walking distance to downtown, walking distance to beach. 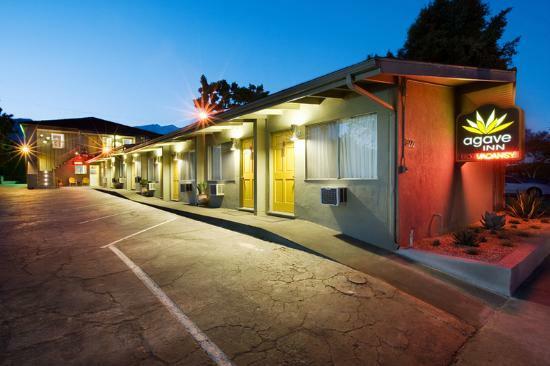 As one of four properties that make up the Shelter Social Club, the Agave Inn is a reasonably-priced, hip boutique motel with bright colors (think lemon yellow doors and teal accent walls) and stylish details, such as Mexican movie posters, painted tiles and lots of cacti. Along with all the regular amenities (fridge, microwave, flatscreen, etc.) there’s free wifi and morning coffee, and it’s a short walk to the restaurants and groceries on State Street. 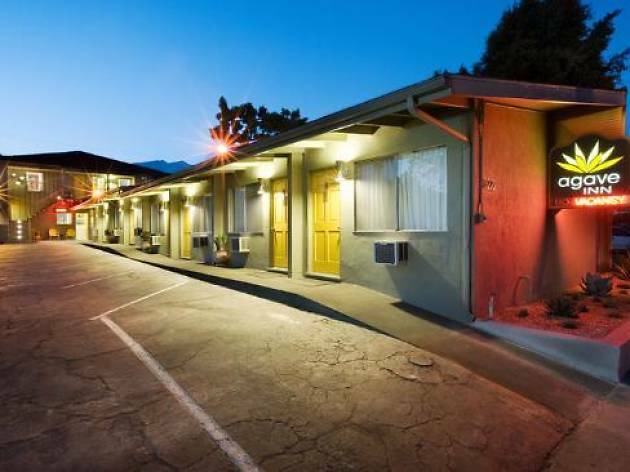 If you’re looking for oceanside digs (or a pool), this isn't be the spot for you—but if you like cheap room rates with a healthy side of charm, Agave will do. Quick stats: Pet-friendly, walking distance to downtown. 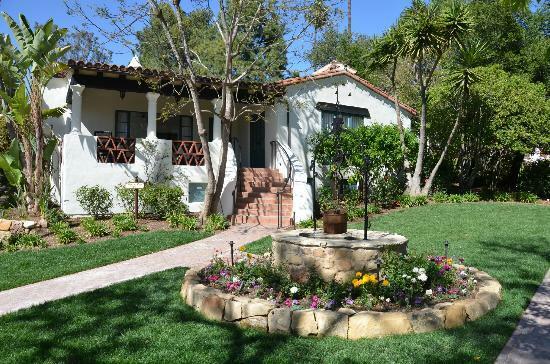 Marvel at the stunning views and serene privacy in this historic hilltop hideaway. 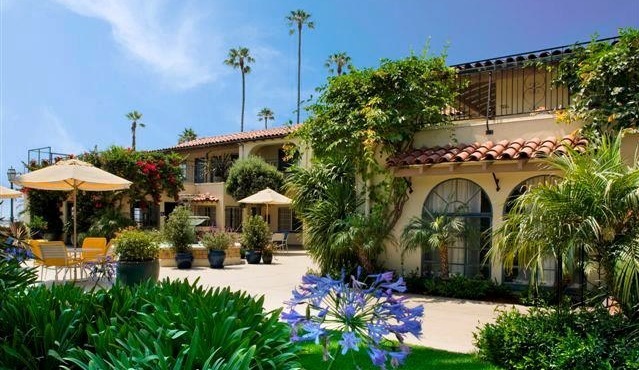 Built in 1918, El Encanto is Santa Barbara’s oldest existing hotel and has hosted legendary celebs, including Clark Gable and Barbra Streisand. The newly renovated site features updated cottages with modern tech amenities, an infinity pool and a state-of-the-art spa. 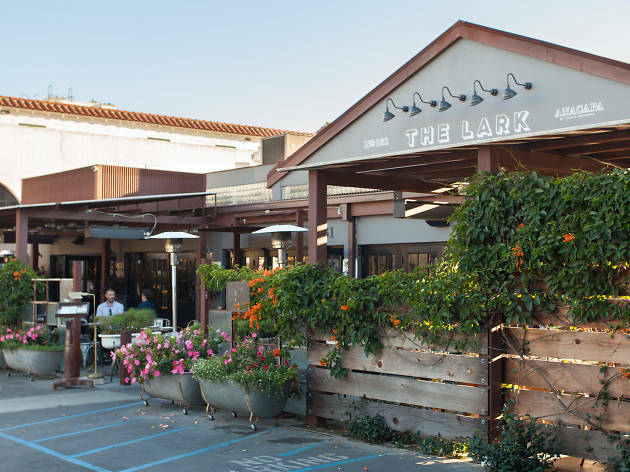 Appealing dining options include a mix of new and classic: locally sourced, coastal inspired fare can be had at The Dining Room, which boasts exquisite terrace views of the entire Santa Barbara coastline (perfect for a romantic candlelit dinner). Quick stats: Pool, spa, pet-friendly. 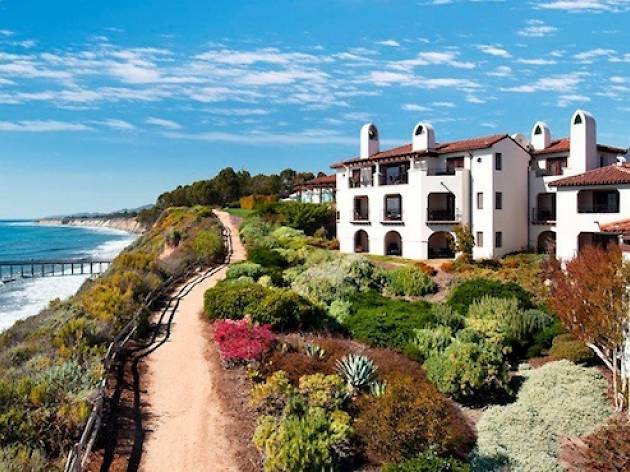 This picturesque getaway could be mistaken for the coast of Italy, set up with Mediterranean-style villas spread out over a long stretch of beach in Goleta (a 15-minute drive from downtown Santa Barbara). Its 354 spacious guestrooms include balconies or patios with views of mountains, gardens or sparkling ocean. Guests have endless recreational activities at hand, with everything from surfing lessons and yoga at the spa to family movie screenings and fireside cocoa and s’mores. Hotel fine dining options are decidedly not the main event, but you can always opt for classic dishes at the bar instead. 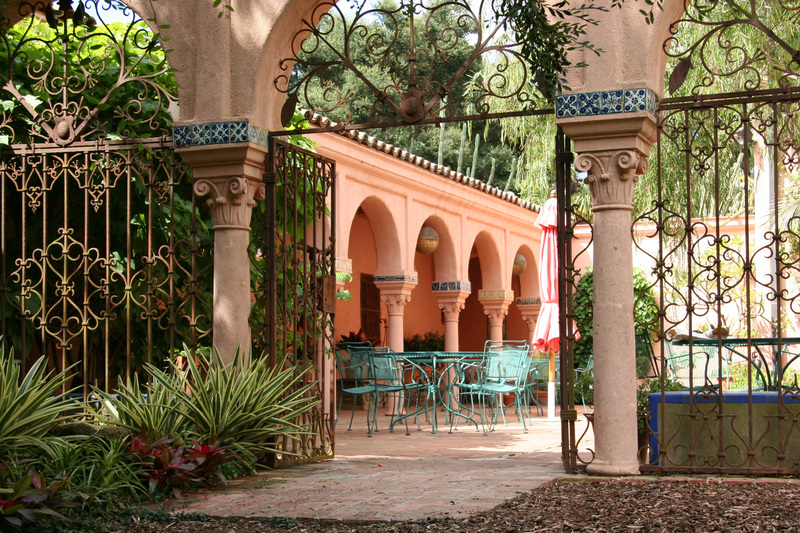 Extra perks include a dog-friendly policy and a supervised kids club that grants parents a bit of quality alone time. Quick stats: Pool, spa, pet-friendly, kid-friendly, walking distance to beach. Opened in 1927 as one of the legendary Biltmore hotels, this beautiful luxury resort’s old-world charm is now enhanced with Four Seasons’ signature pampering. 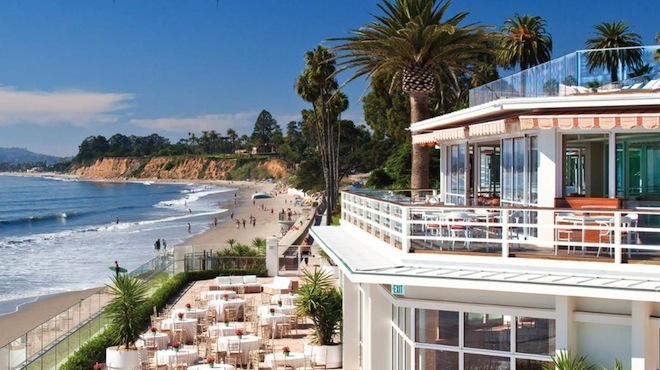 Located on the coast of ritzy Montecito, the Biltmore includes endless amenities—a heated “jungle pool” with underwater music, world-class couples’ oceanfront spa suites, fresh fruit skewers and cooled towels served poolside and a private stairway that leads straight to the famous Butterfly Beach. The services for kids are just as convenient, varying from 24-hour babysitter availability to a “You Dine, We Play” program that allows parents to savor a refined romantic dinner with breathtaking ocean views while the little ones are kept full and occupied. Heavenly? You bet. 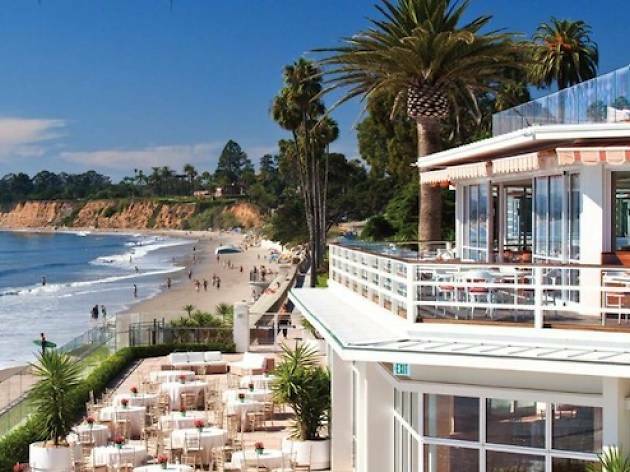 Across the street from the beach and a short walk from downtown Santa Barbara’s restaurant and bar scene, Hotel Milo’s location is hard to beat. While its colorful rooms are a bit faded, Milo is a good fit for visitors who prefer to spend their stay with constant access to the beach and to booze on State Street without worrying about the drive back. This quaint hotel is complete with lush tropical greenery, two pools and a jacuzzi often dominated by a young crowd. Make good use of the free two-hour beach cruiser rentals, too, especially if you're forking out for the steep $30/d parking fee. 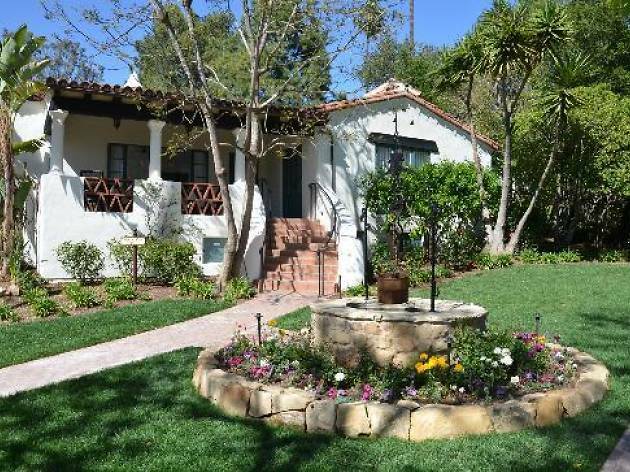 Quick stats: Pool, walking distance to downtown, walking distance to beach. 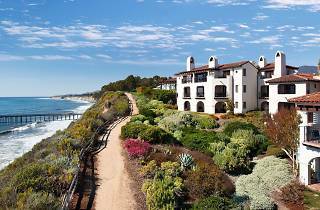 Regardless of whether you’re a beach person, you’ll never be at a loss for what to do in Santa Barbara. State Street is perfect for a stroll and the area’s hiking can’t be beat—plus, there’s a host of excellent restaurants to try, and a great range of hotels for those looking to stop for a while. 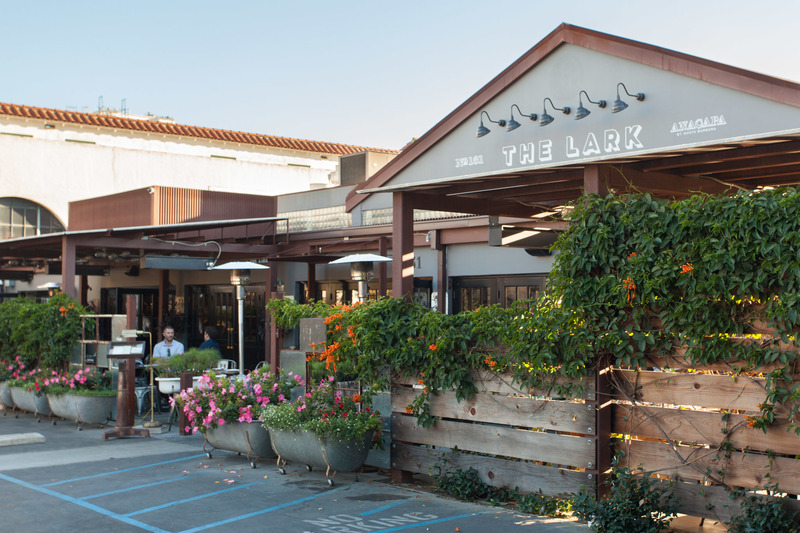 From swanky dinner spots by the ocean to more modest eateries serving exceptional tacos for barely more than a buck, Santa Barbara shines when meal times roll around. Ready or not, here are the best restaurants in town.